The bomber is expected to enter service by 2025. It is to complement existing Rockwell B-1 Lancer, Northrop Grumman B-2 Spirit, and Boeing B-52 Stratofortress bomber fleets in U.S. service and eventually replace these bombers. A request for proposal to develop the aircraft was issued in July 2014. The Air Force initial plans were to acquire 80 to 100 LRS-B aircraft at a cost of $550 million per unit (2010) and envisions some 175 to 200 to be in service eventually. A development contract was awarded to Northrop Grumman in October 2015. A media report states that the bomber could also be used as an intelligence gatherer, battle manager, and interceptor aircraft. At the 2016 Air Warfare Symposium, the LRS-B was formally designated "B-21", signifying the aircraft as the 21st century's first bomber. 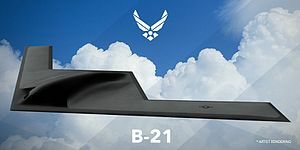 Then-Secretary of the Air Force Deborah Lee James stated that the B-21 is a fifth-generation global precision attack platform that will give the United States networked sensor-shoot capability, thus holding targets at risk. The head of the U.S. Air Force Global Strike Command expects that 100 B-21 bombers will be the minimum ordered and envisions some 175–200 bombers in service. Two internal USAF studies suggest that Air Force could increase its B-21 purchase from between 80 and 100 to as many as 145 aircraft. Initial operating capability is expected to be reached by 2030. In March 2016, the USAF announced seven tier-one suppliers for the program: Pratt & Whitney; BAE Systems of Nashua, New Hampshire; Spirit AeroSystems of Wichita, Kansas; Orbital ATK of Clearfield, Utah and Dayton, Ohio; Rockwell Collins of Cedar Rapids, Iowa; GKN Aerospace of St Louis, Missouri; and Janicki Industries of Sedro-Woolley, Washington. The F-35 program manager Chris Bogdan stated that the commonality of the B-21's engines should reduce the cost of the Pratt & Whitney F135 engine. The B-21 will be designed from the start with an open systems architecture. In April 2016, it was reported that the U.S. Air Force Global Strike Command expected the required number to increase to a minimum of 100 B-21s. In July 2016, the U.S. Air Force stated they would not release the estimated cost for the B-21 contract with Northrop Grumman. The Air Force argued releasing the cost would reveal too much information about the classified project to potential adversaries. The United States Senate Committee on Armed Services also voted to not publicly release the program's cost, restricting the information to congressional defense committees over the objections of a bipartisan group of legislators led by the committee's chairman, Senator John McCain of Arizona. Senator McCain's proposed revisions to the National Defense Authorization Act for FY2017 would have reduced authorization for the B-21 program by $302 million "due to a lower than expected contract award value", while requiring "strict... program baseline and cost control thresholds", "quarterly program performance reports", and "disclosure of the engineering and manufacturing development total contract award value..."
On 19 September 2016, the B-21 was formally named "Raider" in honor of the Doolittle Raiders. The last surviving Doolittle Raider, retired Lt. Col. Richard E. Cole, was present at the naming ceremony at the Air Force Association conference. The Government Accountability Office released a report on 25 October 2016 that sustained the Air Force's decision to award the LRS-B contract to Northrop Grumman. Cost was revealed to be the deciding factor in selecting Northrop Grumman over the Boeing and Lockheed Martin team. The Air Force is planning to acquire a new long-range fighter, known as "Penetrating Counter-Air", that would accompany the B-21 Raider deep into enemy territory. The new fighter, of which few details are known, would help the bomber survive enemy air defenses. Final assembly of the B-21 is expected to take place at United States Air Force Plant 42 near Palmdale, California, at the same facility used during the 1980s and 1990s for Northrop B-2 production. Northrop Grumman was awarded a $35.8 million contract modification for a large coatings facility set to be completed in 2019. Journalists touring Plant 42 reported, "while Northrop would not specify that they planned to produce the B-21 at that location, officials were all but winking and nodding at the subject." The program completed its critical design review (CDR) in December 2018. Maintenance and sustainment of the B-21 will be coordinated by Tinker Air Force Base, Oklahoma, while Edwards Air Force Base, California will lead testing and evaluation. The B-21 is expected to operate out of bases currently servicing heavy bombers, such as Dyess Air Force Base, Texas, Ellsworth Air Force Base, South Dakota, and Whiteman Air Force Base, Missouri. On 27 March 2019, Ellsworth Air Force Base was selected as the Air Force Base to host the first operational B-21 Raider bomber unit and the first formal training unit. ^ Gertler, Jeremiah (2017-06-17). "Air Force B-21 Raider Long-Range Strike Bomber" (PDF). Congressional Research Service. Retrieved 2018-03-25. ^ Gulick, Ed (12 July 2014). "AF moves forward with future bomber". U.S. Air Force. ^ Petersen, Melody (7 February 2015). "New stealth bomber contract likely to be boon for Antelope Valley". The LA Times. ^ Osborn, Kris. "The Northrop Grumman B-21 Stealth Bomber: Simply Unstoppable?". The National Interest. ^ "US Air Force requests $156.3 billion in FY19, plans to retire B-1, B-2 fleets". Defense News. 12 February 2018. Retrieved 13 February 2018. ^ "USAF Global Strike chief seeks beefed-up bomber force". 26 February 2016. ^ Hillis, Amy (2015-11-06). "LRSB: (Yet Another) Tale of Two Protests". Aviation Week. Retrieved 2016-02-27. ^ Weisgerber, Marcus (2015-09-13). "Here Are A Few Things the New Air Force Bomber Will Do Besides Drop Bombs". Defense One. Retrieved 2016-03-02. ^ a b "Air Force reveals B-21 Long Range Strike Bomber". USAF. 2016-02-26. Retrieved 2016-03-02. ^ "USAF reveals Northrop's B-21 long-range strike bomber". Flight global. 2016-02-26. Retrieved 2016-03-02. ^ Clark, Colin. "Coatings Plant Offers Hints On B-21 Production". ^ "USAF Global Strike chief seeks beefed-up bomber force". Flight global. 2016-02-26. Retrieved 2016-03-02. ^ "US Air Force could substantially increase B-21 buy - Jane's 360". janes.com. ^ "USAF names seven top-tier Northrop B-21 suppliers". Flight global. 2016-03-08. Retrieved 2016-03-09. ^ "Spirit's work on new B-21 Bomber will require new jobs". The Wichita Eagle. 2 June 2017. Archived from the original on 3 June 2017. Retrieved 3 June 2017. ^ Shalal, Andrea (10 March 2016). "U.S. F-35 chief expects savings after Pratt's B-21 bomber win". Reuters. Thomson Reuters. Retrieved 10 March 2016. ^ Shalal, Andrea (23 March 2016). "Pentagon to move ahead with $3 billion F-35 upgrade program in 2018". Reuters. Retrieved 24 March 2016. ^ Drew, James (20 April 2016). "USAF basing revised bomber count on 'minimum' of 100 B-21s". Flight Global. Retrieved 26 April 2016. ^ Cohen, Zachary (5 July 2016). "New stealth bomber's cost is under the radar". CNN. Retrieved 5 July 2016. ^ "Proposed National Defense Authorization Act For Fiscal Year 2017" (PDF). U.S. Senate Armed Services Committee. Retrieved 6 August 2016. ^ "The B-21 has a name: Raider". USAF. 19 September 2016. Retrieved 21 September 2016. ^ "Last surviving Doolittle Raider rises to name Northrop B-21". Flight Global, 20 September 2016. ^ "Game Over: GAO Protest Reveals Cost Was Deciding Factor in B-21 Contest". Defense News. Retrieved 2016-10-26. ^ B-412441 report. 16 February 2016. ^ "The Air Force Wants a New Fighter to Accompany Its New Stealth Bomber". 20 September 2016. ^ Clark, Colin. "B-21 Bomber Estimate By CAPE: $511M A Copy". ^ Diplomat, Robert Farley, The. "A Raider and His 'Little Buddy': Which Fighter Will Accompany the USAF's B-21?". ^ "New Northrop facility deal likely meant for B-21 stealth coating". Defense News. 1 February 2017. ^ Pappalardo, Joe (2018-12-06). "New B-21 Secret Bomber Passes Crucial Milestone". Popular Mechanics. Retrieved 2019-04-12. ^ "Air Force announces bases to support B-21 Raider mission". tinker.af.mil. Secretary of the Air Force Public Affairs. November 16, 2018. Retrieved February 11, 2019. The Air Force has selected Tinker Air Force Base, Oklahoma, to coordinate maintenance and sustainment of the B-21 Raider and Edwards AFB, California, to lead testing and evaluation of the next generation long-range strike bomber. ^ "Air Force selects locations for B-21 aircraft". Ellsworth Air Force Base. Retrieved 2019-01-08. ^ "Air Force announces Ellsworth AFB as first B-21 base". af.mil. Retrieved 2019-03-27.